The cross fairway brook gives this hole its name. A straight par 4. This tee is on the highest raised tee. These tees are on the lower raised tee. This tee is forward of the tee board. This tee is further forward. A ditch runs across the fairway some 60 yds from the green. 2 greenside bunkers – 1 front left & 1 front right. 1 greenside bunker – back left. Keep it straight down the middle. 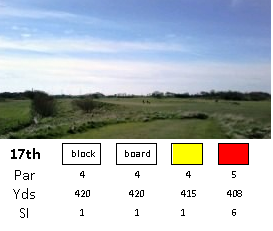 Long drives can reach the green though most golfers prefer to lay-up. The green is in two tiers lower front and a large slope between front and middle. Make sure to play your ball onto the correct level. 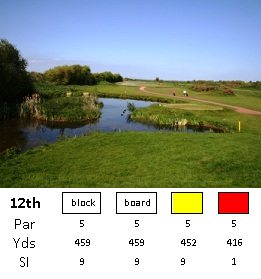 This hole is named after Silverdale Mountain in the Lake District National Park. On a clear day you can see it on the horizon from the raised tees (if you have good eyes). From the tee you can see all problems. This tee is on the middle raised tee. On the raised tee on the north side of the pond. This tee is forward of the tee board on the level ground. This tee is forward of the yellow tee. A path runs across the fairway 100 yds from the green. 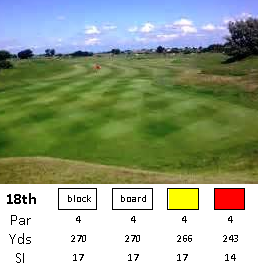 Long drives can reach the green so allow players in front to clear the green (if applicable). The green slopes up from front to back. This hole is named after Alfie Fyles, a popular local caddy who caddied for Gary Player for 6yrs and Tom Watson for 12yrs. From the tee you can see the length of the hole – a straight par 5. This tee is on the raised tee to the left. These tees are on the flat tee besides the path. A ditch runs across the fairway shaped like a crescent moon with both sides running away from you – these often catch the wayward drive. The above ditch runs all along the left side to the 2nd cross-fairway ditch. The 2nd cross-fairway ditch is 140 yds from the green. The trees/bushes run all the way down the left side of the fairway to past the green. An off-line 2nd stroke hit to the right may well find the pond that is short of green distance. Keep it straight down the middle to clear the 1st ditch. 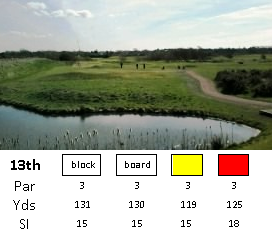 A short to medium drive leaves you with the choice of laying-up to the 2nd ditch or going for it. 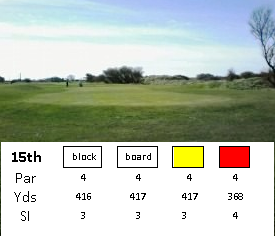 With a well hit drive you can reach the green with your 2nd shot for an easy birdie 4. The green slopes up from front to middle. This tee is on the raised tee top level to the left. This tee is on the raised tee lower level to the left. These tees are forward of the tee board. You can see all the hazards from the tees. Keep it straight to the green. This hole is named after Norman Winders who was a Professional at the Park Golf Club for over 40yrs. From the tee you can see the green – a straight par 5 or 4. Par 5 – These tees are on the raised tee behind and to the left of 13th green. The cross-fairway ditch is 200yds from this Block and White Tees. Par 4 – Occasionally the White Tee is 60yds forward of the Block tee on a raised tee to the left of the fairway. The cross-fairway ditch is 140yds from this White Tee. Par 4 – This tee is on the right of the fairway near the pond. The cross-fairway ditch is 140yds from the Tee Board/White Tees. 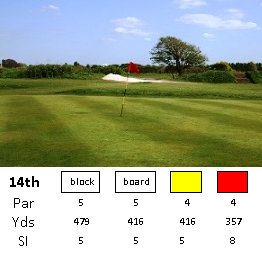 Par 4 – This tee is forward of the Tee Board. The cross-fairway ditch is 130yds from this Yellow Tee. 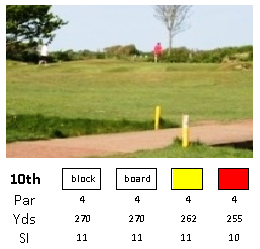 Par 4 – This tee is forward of the yellow tee. The cross-fairway ditch is 110yds from this Red Tee. There is a ditch to the left of the fairway running to the cross-fairway ditch (see above). Out-of-Bounds markers run all the way down the left of this fairway. 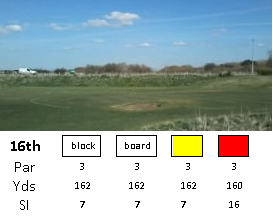 Choose whether to carry the cross-fairway ditch or lay up. This is named after our course designer, Harry S. Colt. From the tee you can see the green – a straight par 4. This tee is on the raised tee before you pass through the ridge to the 15th fairway. These tees are on the slightly raised tee after your pass through the ridge. You can see all the hazards to the green. There is a cross-fairway ditch 70yds from the green. 2 bunkers together on the right at 150yds from the back tees. 1 bunker on the right side at 230yds from the back tees. 1 bunker 60yds on from the above bunker to the right in front of the ditch circa 80yds from the green. 1 bunker to the right just in front of the green. The front of the green slopes up towards the middle. This short hole runs along the current road – used to be an airfield runway during the 2nd World War. From the tee you can see all the problems – a straight par 3. These tees are to the left behind the 15th green. 2 bunkers middle of the green – left & right. Keep it straight to the middle of the green. The green slopes up front to back. This hole is named after the Plateau Green. A slight left dog-leg par 4 from the Block & White Tees. On the left of the fairway on the ridge. These tees are in the middle of the fairway. All hazards can be seen. Out-of-Bounds on the left all the way to the 11th tee. Drive for the tall white post. Tiger line is to the left of this. 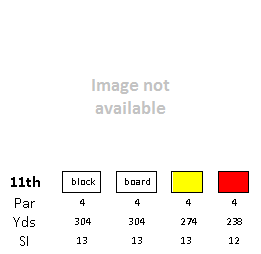 Your shot to the green needs to find the flag-tier. Your ball will easily be thrown off to both sides and the back being a plateau green. The green is in 2 tiers. Forward of the back tees. Out-of-Bounds on the left all the way to the green. The Green is drivable for long hitters. 2 front greenside bunkers – left & right. Depending on where the flag is positioned you drive to left or right centre. The green is a flat green.